Dr. A. Ródenas leads his own research line on novel 3D crystalline nanophotonics and harsh-environment nanophotonics at the Institute for Photonics and Nanotechnology (IFN) of the National Research Council of Italy (CNR). He works in collaboration with Dr. Roberto Osellame within the FAST Group. Since May 2017 he is a European Union Marie Skłodowska-Curie Individual Fellow. Starting from May 2019 he will be appointed Ramón y Cajal tenure-track Fellow at the Physics Department of the Universidad de La Laguna (ULL) in Santa Cruz de Tenerife (Spain). Previously, he has worked as postdoctoral researcher at UK Heriot Watt University (Edinburgh, UK) for two and a half years, with his own Spanish Government Postdoctoral Fellowship on a project on fabrication of 3D Photonic Crystals. 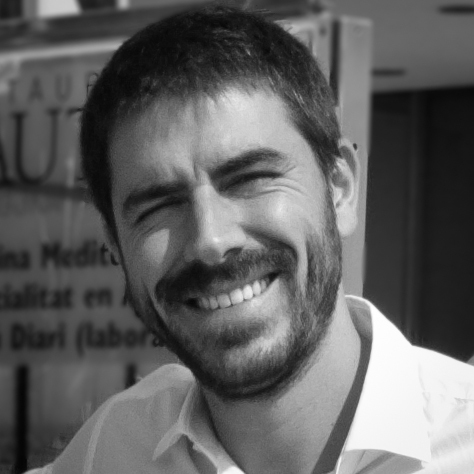 In September 2012 he joined the Universitat Rovira i Virgili (URV, Spain) for a period of 4 years working as associate profesor and researcher, and joining a EU Collaborative FP7 project (www.jediace.net) as lead scientist in charge of developing novel photonic sensors from first concept to industrial environment testing. He has co-directed 2 PhD theses -Dr. J.Martínez (April’17) and Dr. H-D Nguyen (Sept’17)-, and currently co-supervises a third PhD thesis on novel photonic IR sensors at the URV (defense expected mid 2019). He imparted Degree and Master courses at the Universitat Rovira I Virgili in three different subjects from 2013 to 2015, and also taught at Heriot Watt University (UK) in 2011. The multidisciplinary work of Airán Ródenas in the field of 3D engineered photonics and 3D laser nanoprocessing has led to the publication of over 70 papers in high impact journals as Nature Photonics, with an h-index of 20 (Google Scholar). He has 4 invited talks in international conferences, and over 17 oral presentations in international conferences and seminars. He has worked as international scientific project evaluator for the argentinian ANPCyT state agency, is an expert evaluator member within the Spanish State Research Agency (Agencia Estatal de Investigación), and is frequent reviewer of international photonics and applied physics journals [Light and Scientific Reports (Nature Publishing Group), Applied Optics, Sensors & Actuators, Optics Letters, Optics Express, Optical Materials Express, Chemical Physics Letters, Applied Physics Letters and others]. He has participated in 5 international research projects, and 14 projects in total. He is the inventor and co-author of 1 patent for anti-icing aircraft automated systems. A. Ródenas maintains collaboration with 18 groups from 11 countries (Italy, France, Germany, Japan, UK, Canada, Australia, China, Brazil, Argentina and Spain), 12 of these collaborations being done independently after his PhD period proving his independence. He maintains industrial collaborations in the fields of air transport (Dassault, Fuji Heavy Industries) and photonics (Resolution Spectra, Optoscribe). He has performed 7 visiting research stays, and has the experience of working as part of 8 different groups in 6 different countries.